68° 18’ 132” N, 166° 58’ 487” W, June 22 — Healy continues to keep the scientists and crew busy with science stations around the clock. The sun appears to rotate around us each 24 hours, dipping near the horizon about 3:00 a.m. 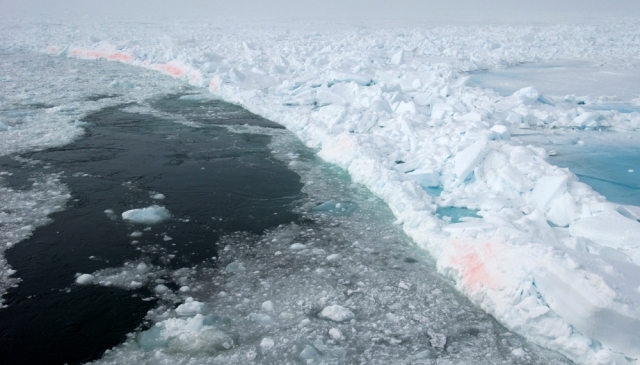 This morning a science party went on ice a few miles from the village of Cape Hope. There was an open water lead along the shore where we could see a few venturing out in their boat, and also going onto the ice, although on different floes that would be too shallow for us to get near. We did trade “good morning good morning” greetings on the radio with someone in town. 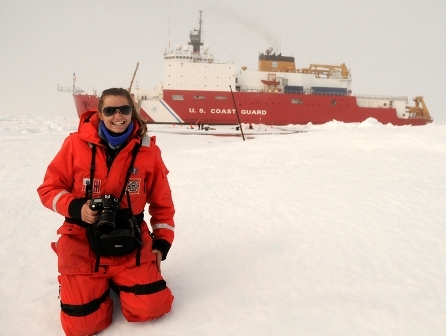 72° 06’ 2” N, 160° 41’ 8” W, June 26 — A couple days ago Healy was challenged by the ice conditions. 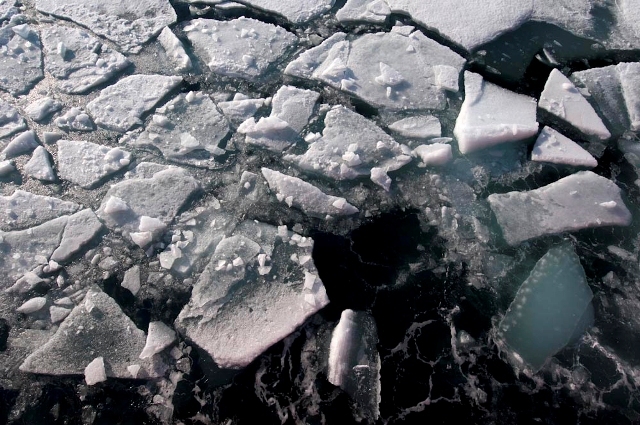 About 75 nautical miles northwest of Barrow, and only two miles into the ice edge, we ran into numerous, and sometimes continuous, old rubble piles, which look like boulders lying around on the ice every which way. The rubble is from pressure ridges that form when ice floes get pushed against each other due to wind and currents. There were plenty of both ridges and rubble, and with less than a mile of visibility, it makes for slow going since we cannot pick out the best path in advance. 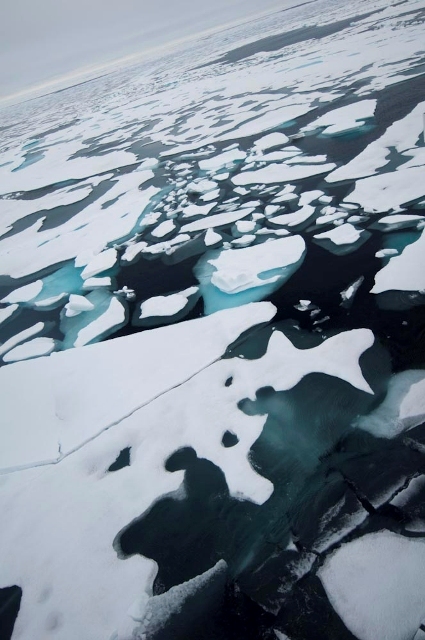 The floe we have spent the last couple days in is a vast floe, miles and miles across, made up of a bunch of smaller flows that mixed up through the long Arctic winter. This resulted in pressure ridges and rubble piles over 30 feet thick, and quite a few areas where two floes got stacked up and are well over 10 feet thick. 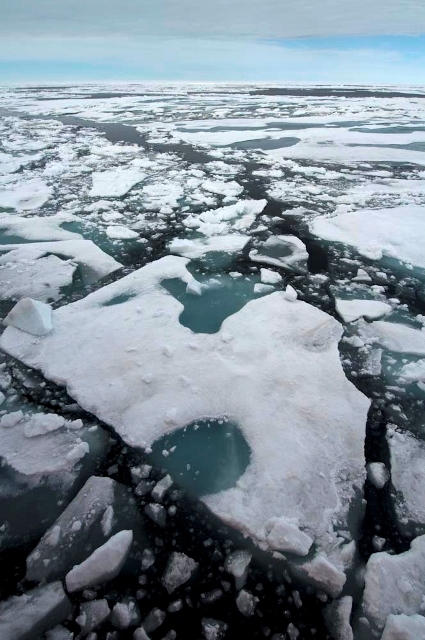 Since the floe is so large, there is really nowhere for the ice to go except in our track-line behind us. In pressure ridge and rubble areas, we back and “ram” into the ice, and may only move 30 or 40 yards with each back and “ram.” The “ram” part of this is not how it sounds. 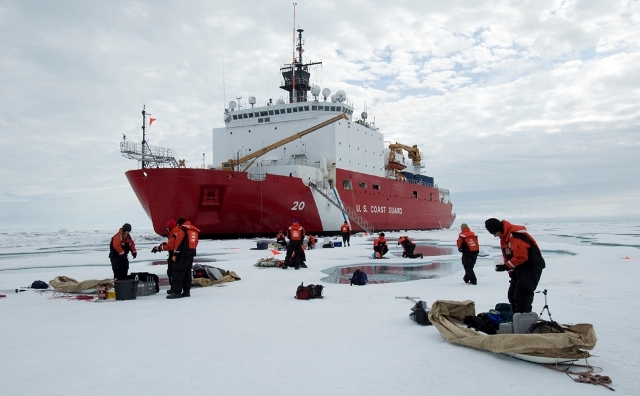 The Healy’s bow is sloped such that we ride up on the ice with the help of momentum, and then our 16,000 ton weight crushes the ice downward and along the sides of the ship. The power we use would propel the ship to at least 16 knots in open water, but in the ice our speed rarely exceeds 6 or 7 knots. The rest of this energy goes into the ship riding up on the ice and crushing it downward. 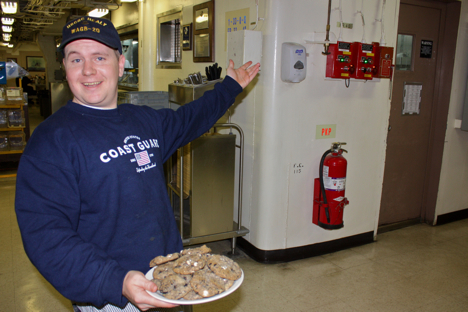 The officers of the deck, or OODs, assigned to drive in the ice are all smiles when we are challenged with these ice conditions. No other way to describe it than just fun driving a ship into something on purpose! 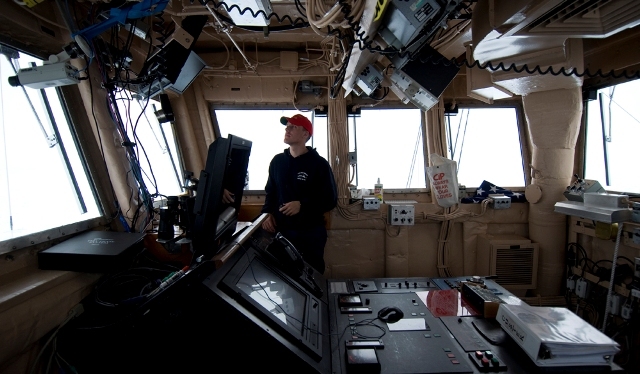 Coast Guard ensign Nicholas Custer, a student engineer, gets ready for a run into the sea ice in Aloft Con, an elevated steering room at the highest point of the ship used only for ice breaking. “We had one run that in 45 seconds went farther than we went yesterday in seven hours!” Nick was proud to say. 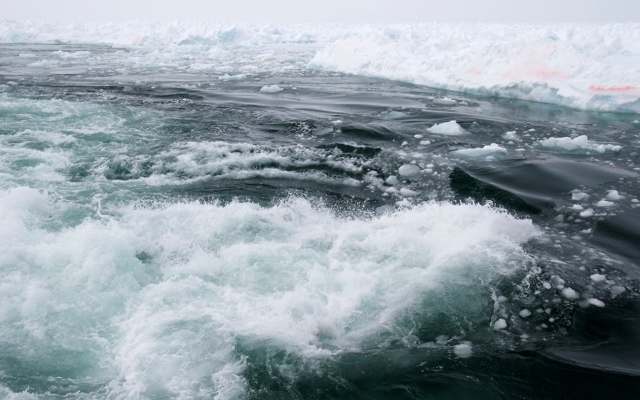 After ramming up onto the sea ice, the Healy slowly backs away. The Healy continues to back into its track-line. From Aloft Con, Nick propels the Healy forward in order to give the ship momentum for another run. 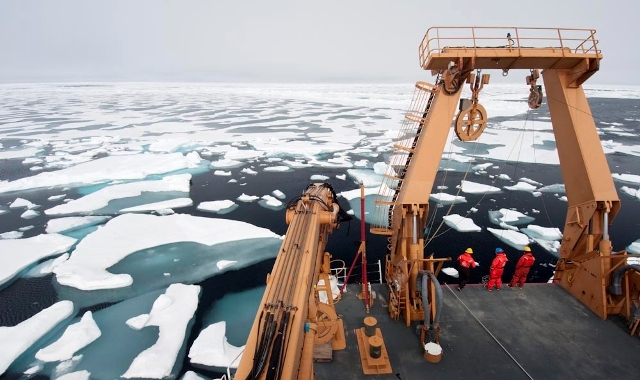 OODs operate the propellers “all ahead” at top speed when going forward into the sea ice. This view of their wake is from the faintail at the stern. 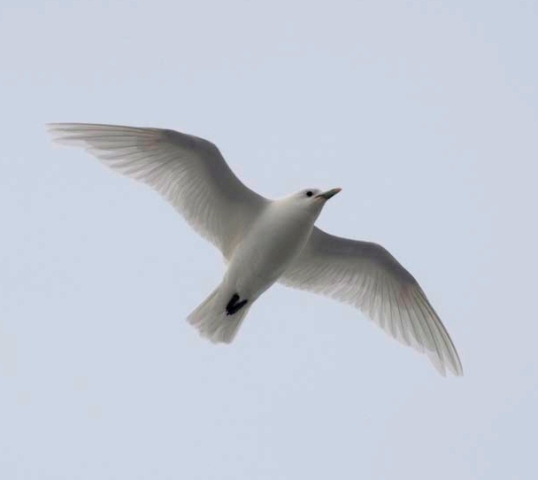 66° 44’ 11 N, 163° 42’ 18 W, June 19 — Saturday night, fog obscured the sun and bathed members of the sea ice team in haze as they disembarked from the Healy to work on an ice floe off the port side. 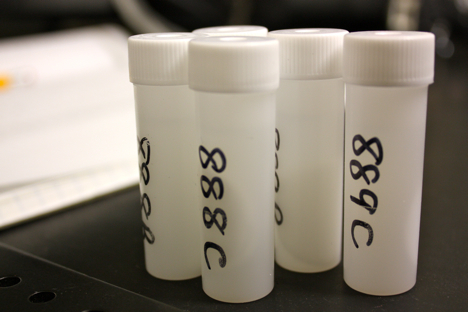 The group took multiple ice cores and water samples to learn about the biological activity and optical properties of ice. 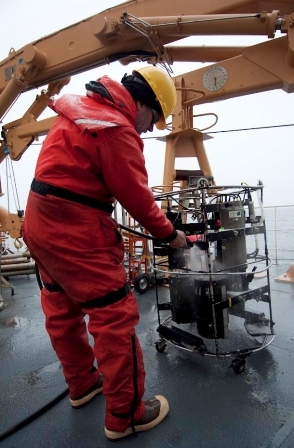 “It’s always nice to get to the first ice station,” said Don Perovich. 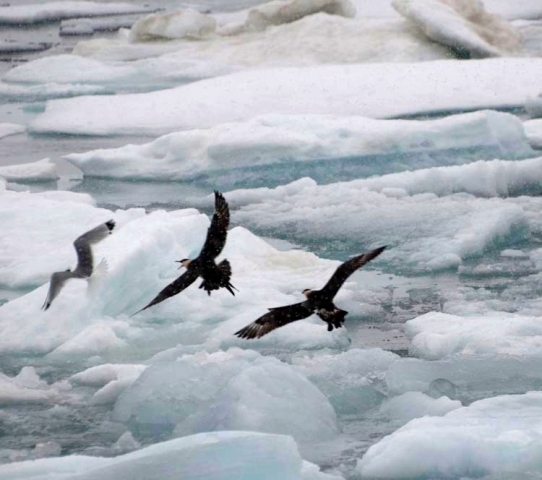 But choosing the right ice floe was tricky. 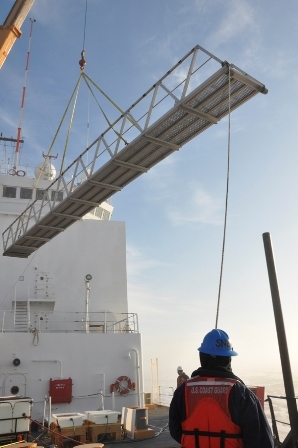 The sea ice team spent the entire afternoon high up in the bridge — the observation deck where the captain navigates the Healy’s course — scouting ice floes in Kotzebue Sound with binoculars. 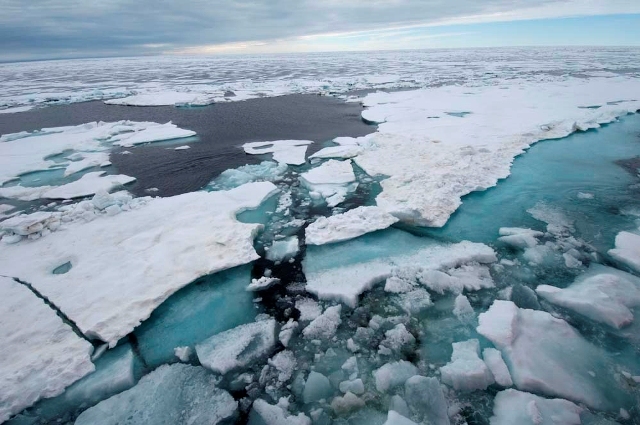 “Because the area was mainly first-year ice undergoing quite a bit of melting, it was fairly fragile and would have been difficult to walk on,” said Don. Keeping potential pieces straight posed a challenge for the team as well. “We kept saying, ‘It’s the white one! It’s the white one with a line!’” joked Chris Polashenski of Dartmouth. 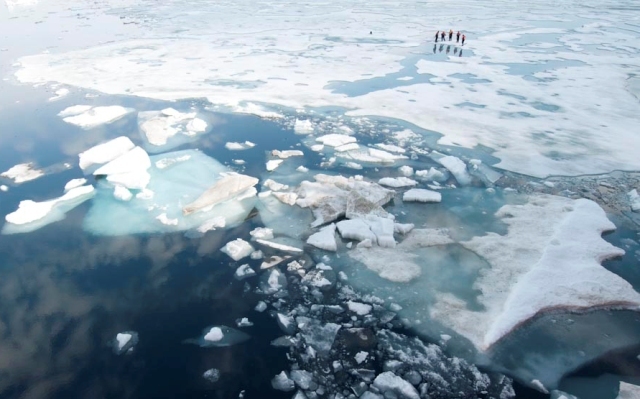 The group finally chose an ice floe that was different than the others: a thick piece of rafted ice, or two slabs on top of each other. 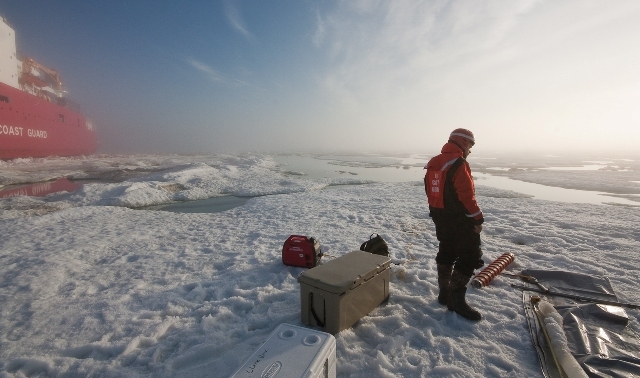 Next, the sea ice team deployed instruments down the holes left from the coring to take water samples. 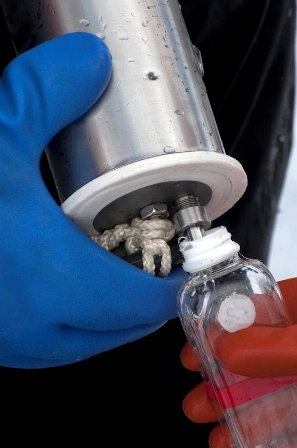 A layer of fresher water lies directly beneath sea ice, so these samples will allow scientists to measure how conditions under sea ice differ from those in the open ocean. 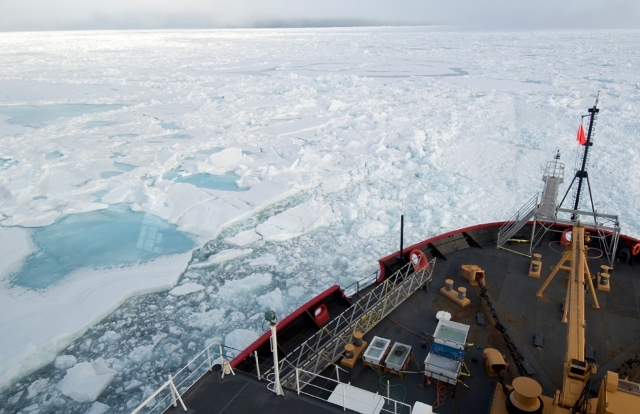 Studying sea ice at different stations by ship, rather than researching the same piece of sea ice throughout a melt season, will also allow scientists to consider variations between regions. 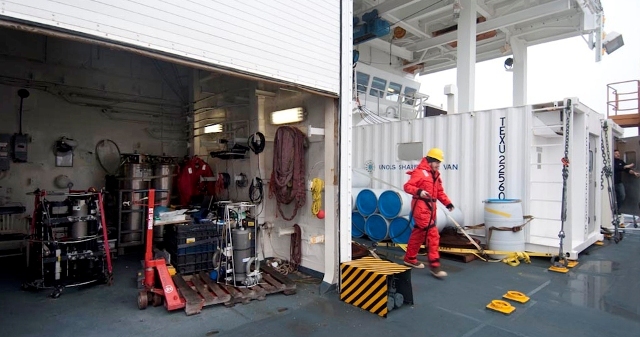 Furthermore, they will be able to use sea ice data collected in the field during this ICESCAPE research cruise to check against data from satellites. “We want to relate what we see here with our own eyes to what the satellites are telling us,” Don said. 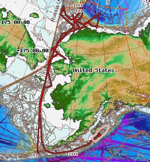 In early July, the sea ice team will have ten days of dedicated ice time in the Beaufort Sea. 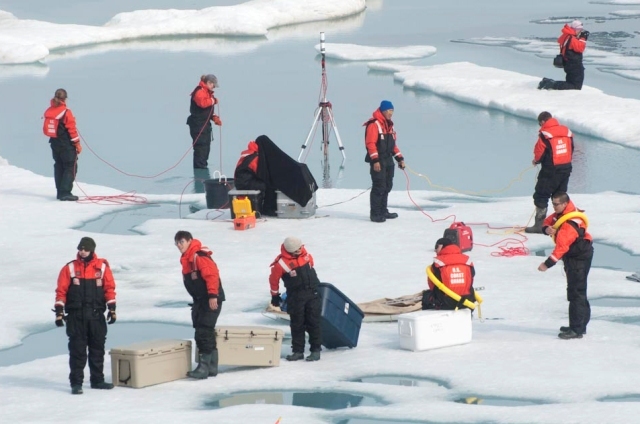 Soon a small group of scientists in orange jackets and red hard hats working on sea ice at twilight will become a common sight. 60° 7’ 155” N, 149° 25’ 532” W, July 24 — The fog lifted as the Healy steamed through Resurrection Bay ahead of schedule Wednesday morning. We pulled into port just before noon, enough time for both scientists and Coast Guard crew to disembark in Seward and readjust to the motionless ground beneath our feet, moving automobiles, fresh salads, the smell of flowers and vegetation, cell phone service, and other civilians! Wednesday night, Bonnie Light (University of Washington) and I watched the colors of the sunset intersect the moon from the Healy’s helo deck. We spoke about the incredible amount of effort to reach the Arctic, a place so difficult to convey through prose or imagery. 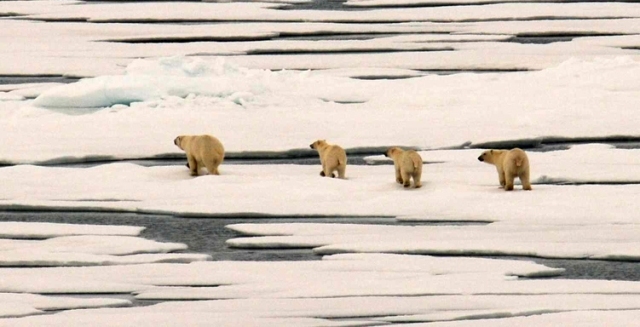 “Sea ice may as well be the moon,” Bonnie said. We were already craving it — and the alternate reality of life aboard a ship — just hours after docking in port. Among the many other aspects of icebreaking I’ll miss are walruses, polar bears, CTD casts, fresh-baked desserts, steel-toed boots, and 24 hours of sunlight. 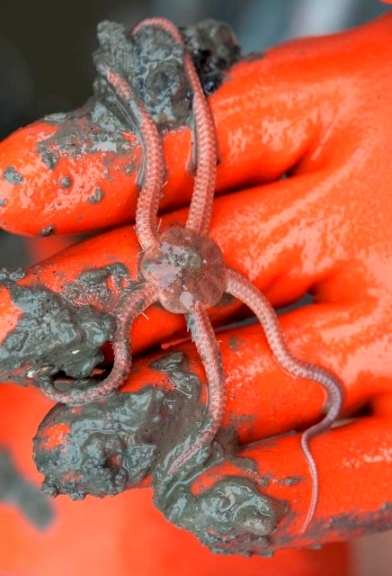 On top of daily lab work that consumed at least a third of my waking hours at sea, blogging for so many loyal and curious followers has been an honor. 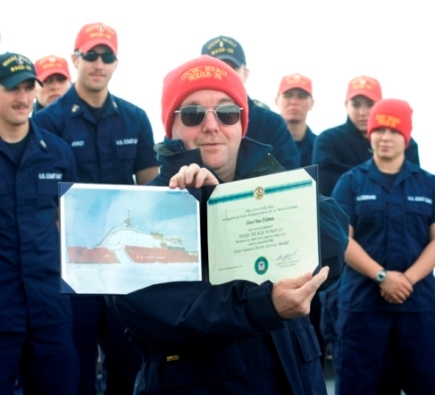 I wish I had had more time to tell you even more about our Arctic research and phenomenal Coast Guard hosts! 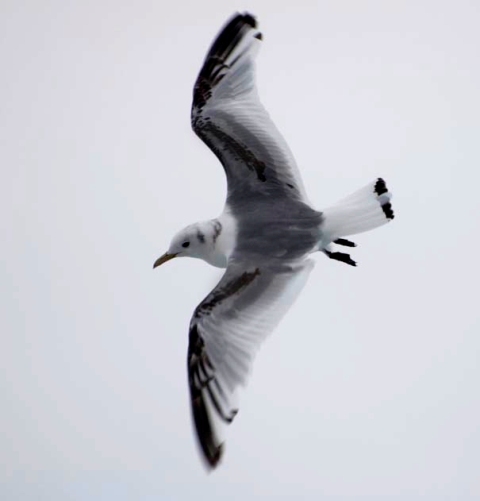 Thank you for reading, commenting, and supporting ICESCAPE 2010! 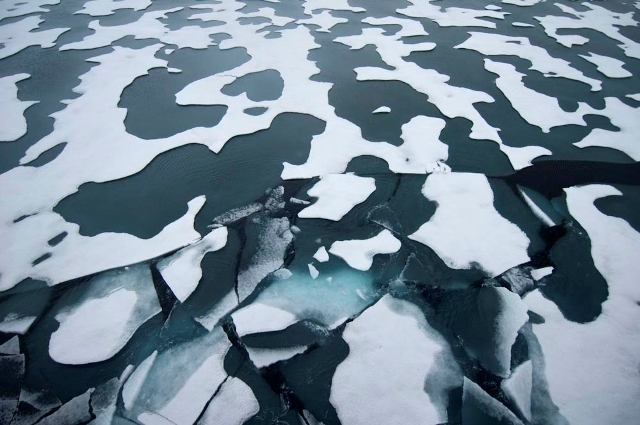 Sea ice breaks into little fragments like these, known as brash. The dark line of ocean here is a lead, an area of open water between sea ice. Melt ponds during our final night in the ice. 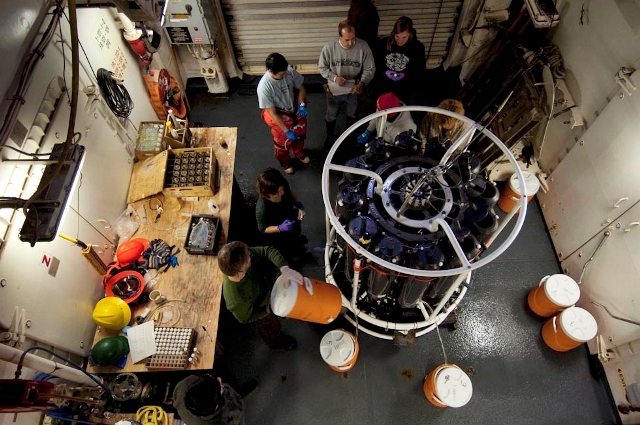 Ice Station 10: Stanford University researchers (front row) haul crates of ice cores back to the Healy, while Clark University researchers (back row) deploy an optical profiler underneath a melt pond through the sea ice to examine how light varies with depth in the water beneath. Ice Station 11: Matt Mills of Stanford University fills a glass bottle with under-ice water for Christie Wood of Clark University. 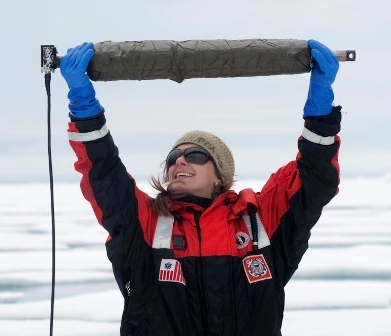 Ice Station 11: Ruzica Dadic lifts an instrument that records the amount of solar radiation through the sea ice. She holds it above her head so her face doesn’t affect the measurements. 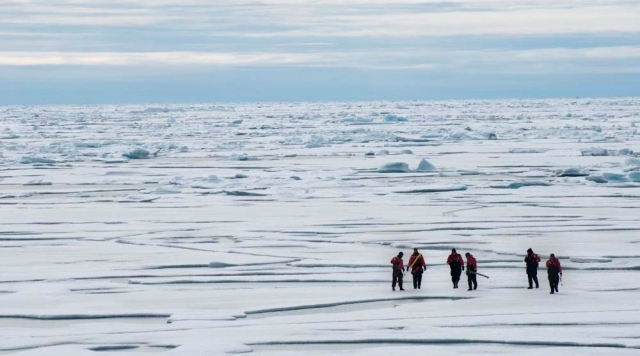 Ice Station 12: During the final ice station, a few scientists plus Coast Guard rescue swimmer and swimmer tender walked to the edge of the floe and back conducting measurements — a total distance of about a mile.